Game developer Glu Mobile has changed the face of mobile gaming. Their top-grossing award-winning products range from action and sports titles like MLB Tap Sports Baseball 2018 and Deer Hunter 2018 to the hugely successful celebrity game Kim Kardashian: Hollywood and casual lifestyle titles Design Home and Covet Fashion. With a new San Francisco headquarters opening in late 2017, they asked Kiosk to help them define their brand voice. Glu wanted the right voice to express their brand personality and for Kiosk to capture their distinctive culture and values. They needed a consistent voice that would help energize current employees and express what makes Glu different to potential hires in the competitive games industry job market. We set about interviewing key stakeholders. We listened carefully and identified recurring themes in areas like activity, inclusiveness and risk-taking. Then we crafted brand guidelines that expressed Glu’s personality. At Glu’s new headquarters, you’ll find a culture of creativity and collaboration that’s reflected in the language they use to describe themselves online. You’ll also find a distinct shade of blue that leapt from the digital pages of a color palette we developed as part of our brand exploration. 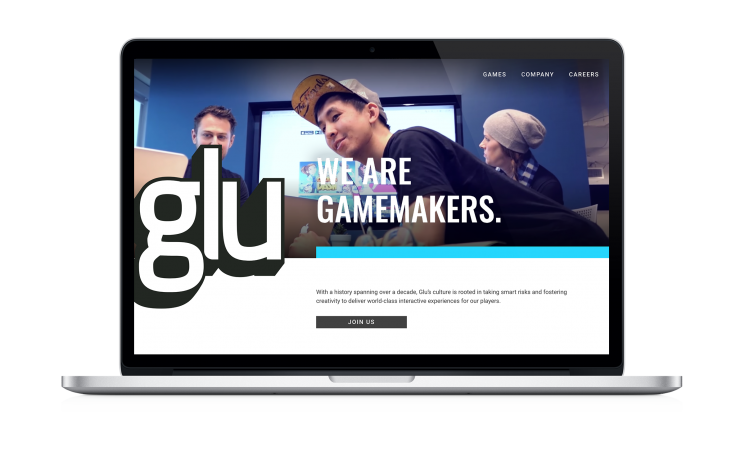 Sharing a common, collaborative spirit with Glu, we worked with their in-house design team to help evolve the Glu logo.